Welcome to 21 Bufflehead Drive- the perfect spot to create Kiawah Island memories with family and friends! Find yourself at this oceanside retreat with immaculate Canvasback pond views, and experience a trip of a lifetime. 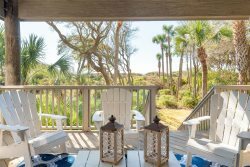 This gorgeous home is exclusively designed with luxury in mind, from the 4,700 square feet, modern and updated furniture, and a relaxing private pool, what more do you need to enjoy the magnificent Kiawah Island and Atlantic coast. Entering the home, you are greeted with gorgeous natural light and expansive windows. The bright home has a great floorplan that is conducive for all with easy access throughout. The living room is fully equipped with a flat screen TV, and comfortable furniture that opens to the pool deck. The dining room is just off the living room and has seating for 6 guests. There is also a sun room perfect to relax with a great book. Moving into the kitchen, it is both functional and beautiful. It includes features such as granite countertops, espresso-toned cabinetry, and stainless appliances. The large center island is perfect to prep a meal or mingle around in one of the 4 bar stools. The first of the two master suites is located on the first floor. It includes a king size bed, and offers direct access to the deck. The master bath has a large soaking tub and separate walk-in shower, as well as double vanities. Moving to the second floor, there is a large living area with a wet bar area that includes a wine fridge, sink, and microwave. The second master suite is on this floor and has a king bed and ensuite bathroom. It accesses the screened in porch with lovely views of the lagoon. Down the hall, are three bedrooms. The third bedroom has a queen room with ensuite bath. The fourth room also has a queen bed and shares a Jack n' Jill bath. The fifth room has two twin beds, shares the Jack n' Jill bath, and accesses the open-air deck. Lastly, the sixth bedroom is on the third floor and is equipped with two sets of single bunk beds and a double bed. There is also an ensuite bathroom. It is a perfect child/teen room! Take a walk to the outdoor area of the home- which is a relaxing retreat! The pool is perfect for taking a dip on a hot summer day. There is plenty of seating and chairs to enjoy the evening outdoors. If this sounds like the home you are looking for, we'd love to welcome you to 21 Bufflehead Drive! **This home is for sale. There is a possibility there may be real estate showings during your stay. We do have to allow any showing requests and will notify you as soon as we have any requests for this. Thank you for your cooperation!